Update: This deal to get unlimited data free for a year from Sprint must be done online through their website and can’t be done in-store. When you switch to Sprint you can now get a free unlimited data plan for one year. 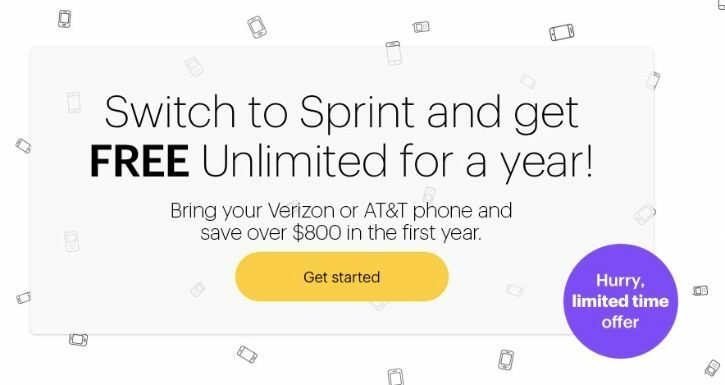 If you’re a new customer or switching to Sprint from Verizon or AT&T you can get this plan which gives you unlimited talk, text, and data for an entire year. The only payments you will make are the cost of the new device you bring after trading in your old device. The only catch to this plan is that you must bring your old device (BYOD) from either Verizon or AT&T to be eligible. Other than that you’ll have a free unlimited data plan and just pay the monthly price of your new device on that plan and any fees associated with that. There are no activation fees or annual contracts associated with this discount. You can access the rest of our Sprint promo codes through the link provided. That page is updated with a mix of promo codes and deals for both new customers and existing customers. If you have any questions about this deal you can leave them below in the comments and we will do our best to get you an answer. We keep getting the question of whether you can cancel your contract after the first year. After looking at the fine print it seems like you can cancel after the first year as there is no annual contract. The promotion is geared towards trying to get new customers to try out Sprint services.